For nearly forty years the debate over the moon landings has been argued; did the United States put men on the moon was there a great conspiracy to convince the public that men had acutallu landed on the moon? Included here is a video series "Secret Space - Was the Moon Landing a Hoax" which deals with such things as Hitler's involvement in a secret program and NASA's connection and examines the question about whether or not the United States actually put men on the moon in the 1960's. 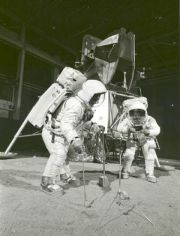 Read more about the Moon Landing Conspiracy Theory and watch the video series. According to the chemtrail conspiracy theory, the trails you see in the sky behind certain aircraft contain unnatural vapor reported to contain chemicals. There are various ideas about the content and purpose of the chemtrails. One school of thought claims that it is a covert project designed to stave off global warming. Another claims that experiments in weather control are being done. Yet another holds that we are being sprayed with some sort of toxin from aircraft. Included here is a chemtrail documentary "Chemtrails: Clouds of Death" a full length video a lot of interesting information. I would have preferred them not to have used special effects on their voices, as it makes it seem a litttle hokie, but overall I think there is a plenty of things you can learn from this video. It will get you to thinking! 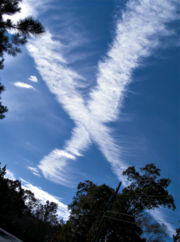 Read more about The Chemtrail Conspiracy and watch the video. More Conspiracy Pages Coming Very Soon!